Maintaining optimal vitamin D levels in children is a concern for many parents. Known as the sunshine vitamin, one of the key roles of vitamin D is maintaining serum calcium and phosphorous balance, a key aspect of bone health. 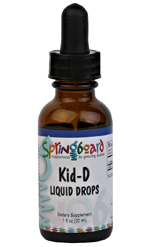 While vitamin D is available in both forms as supplements, studies have found vitamin D3 is the preferable form as it has been found to maintain active vitamin D levels for a longer period of time.Kid-D Liquid Drops helps growing bodies achieve optimal levels of vitamin D and supports overall health in children. It delivers a targeted amount of vitamin D in an odorless, tasteless liquid that can be added to any beverage. Suggested Use: 1 drop per day or as recommended by your health care professional.